So far I have talked about the canals of Cape Coral and the many boating opportunities in the area. Some of the fun here takes place on land, too! In addition to the many parks I wrote about in my last post, Cape Coral is also home to over 90 miles of bike routes. Biking in Cape Coral can be real fun, these bike routes provide many variations for your riding pleasure. The various routes can take you by nature preserves, scenic canals, marinas, and golf courses, etc. You can choose a route based on a whim or with a specific destination in mind, including shops and restaurants. One of the routes goes around the 49 mile perimeter of the city! What if you ride too far and are too tired to ride back home? Don’t worry! Our public buses are equipped with bike racks! Along the routes you will also find informational maps and kiosks showing some of the landmarks, facilities, and recreational activities that you can check out. It only makes sense that a city that is so well-designed for biking would host a big biking event. Every January Cape Coral holds the Tour de Cape. This weekend event includes a 5k run as well as 15, 30, 60, & 100 mile bike rides. The routes are flat and safe so that families can participate as well. 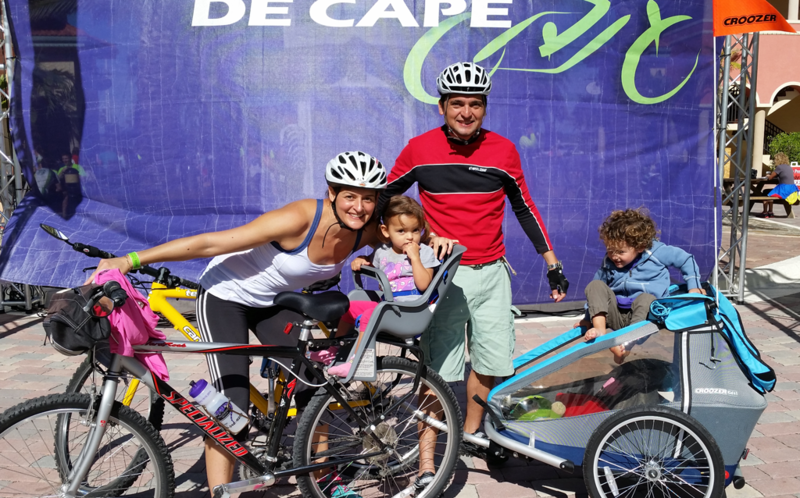 The Tour de Cape is not meant to be a race; rather, it’s a way for casual and serious bikers to get out and ride together through this beautiful area. People from all over the world participate in this annual event that takes advantage of the great biking routes and weather that Cape Coral has to offer. People who don’t bike go out to cheer on the riders. Some young citizens of the Cape set up cold drink stands to earn some money! This past weekend my wife and I participated in the 24th Annual event. We rode the 15 mile route with our two children. It was a wonderful way to spend the day as a family. My son, though only 3, was really into the spirit of things and kept yelling at me to ride faster! I guess he didn’t get the part about it not being a race!